Jenny Jiva - a Fiji youth climate change activist talks to PMC's TJ Aumua as part of the Bearing Witness project. The Pacific Media Centre was awarded a Small Research Grant by the Research Innovations Office (RIO) in late November 2015. 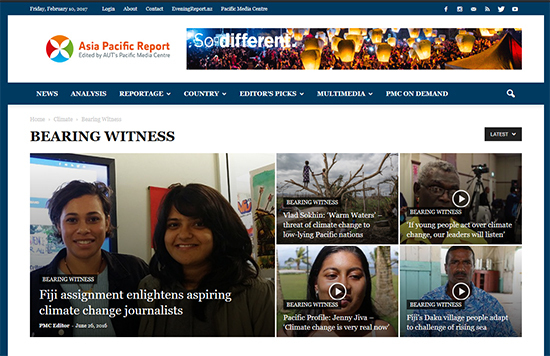 This enabled the Centre to embark on a three-fold initiative under its “Bearing Witness” project by (1) linking with a Baseline 16 Pacific countries media and climate change project in partnership with the University of the South Pacific Journalism Programme, (2) establishing a Climate Change section on the Centre’s new current affairs website Asia Pacific Report, and (3) sending one current student and one honours graduate on a two-week climate change mission to Fiji for two weeks during the mid-semester break. The first phase of the project was to link with the two-year University of the South Pacific Media and Climate Change baseline research project at the end of 2015. In January 2016, part of the funding was used to establish our climate change platform for regional reporting on the Centre’s new current affairs website. The third phase was to dispatch Postgraduate Diploma in Communication Studies (Journalism) student Ami Dhabuwala and BCS (Honours) graduate TJ Aumua (selected after contested selection process and interview) to Suva to be attached to the Pacific Centre for Environment and Sustainable Development (PACE-SD) where they joined masters and PhD students on climate change research projects during the mid-semester break, April 17-30. 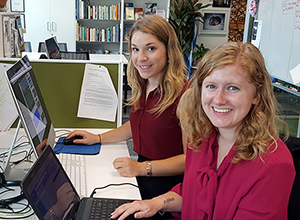 Ami and TJ undertook to do a series of reports on climate change in Fiji and the Pacific. They also visited a remote village (Daku in Tailevu) to research and report on how climate change has impacted on the people’s lives. Their series of reports, audio and video are now a public resources and can be accessed here on Storify, which has had more than 1800 visits since the project was established. 2018 Bearing Witness project students Blessen Tom (left) and Hele Ikimotu talk about the project on the PMC's Southern Cross programme at Radio 95bFM. View the 2018 trailer for Blessen and Hele's documentary Banabans of Rabi: A Story of Survival, premiered at the Nuku'alofa International Film Festival in November 2018. The documentary has been entered for several other film festivals. The future: It is planned that the students work will be linked to a major five-year “Bearing Witness” microsite public resource project in association with Little Island Press. 2017 Project: Two graduate journalists are going to Fiji for Year 2 of the Bearing Witness project on April 16-28 -- Kendall Hutt and Julie Cleaver.